Twin turrets brace each side of the massive three-story, wood-shingled mansion that silently overlooks the calm beauty of Lake Tahoe. From the elegant, long porch, spanning the two towers, you can see the sun rising over the Sierra Nevada, casting the day's first light on the lake. The house is the Helmann-Ehrmann Mansion at Sugar Pine Point State Park, one of the best representatives of the style of fabulous summer homes that were built on the shores of Lake Tahoe during the early 20th century. Today, you can tour the mansion, which was built in 1903, picnic on the grounds, or play in the water of the lake. Located about 20 miles north of the intersection of U.S. Highway 50 and California State Highway 89 on Lake Tahoe's west shore, Sugar Pine Point Park is operated by the California State Park system. The house, which boasts 11,703 square feet, including more than two dozen rooms and several large, stone fireplaces, was built for Isaias W. Hellman, a successful San Francisco banker. In 1897, Hellman began quietly acquiring some 1,016 acres of land on Lake Tahoe's west shore, including more than two miles of lakefront. Within a year, work began on the house, built in a modified "Queen Anne" style architecture with gables and turrets. 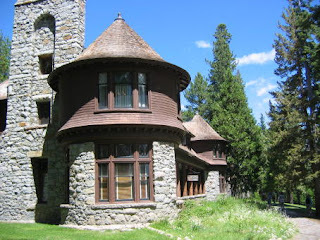 The exterior, however, incorporated natural wood-shingling and rough-cut stone which have, in more recent years, become known as early Lake Tahoe architecture. In addition to the main house, called “Pine Lodge,” the estate included separate servants quarters, boathouses, an electric power plant, an icehouse and a tall water tower, all of which are still standing. In 1920, Hellman died and the house was inherited by his daughter, Florence Ehrmann. The Ehrmann family added a tennis court and a second, smaller house for the children during the 1930s, and continued to use it as a summer retreat. In 1965, Mrs. Ehrmann's daughter, Esther Lazard, sold the estate to the state of California. Since then, the state has consolidated the property with other lands to create the 2,300 acres Sugar Pine Point State Park. Today, visitors can tour the mansion between Memorial Day and Labor Day, (it's still only a summer home). Throughout the year, the park grounds are open for picnicking or enjoying the wonderful beaches and views of the lake. The mansion tour is worthwhile for providing a glimpse into the lifestyle of those who once called it home (as an example, just check out the rugs and overstuffed leather chairs). The first part of the guided tour, which lasts about a half hour, includes a description and history of the house and its inhabitants. After that, however, visitors are allowed to explore the rooms of the second floor. North of the house, are a pair of cabins built by General William Phipps, a veteran of the Indian Wars, who was the original owner of Sugar Pine Point. The one-room wooden structures, open in the summer, were constructed in the 1860s and have been partially restored by the park service. Adjacent to the cabins is a small trout stream, General Creek, that feeds into the lake, as well as the start of a quarter mile nature hiking trail. Across Highway 89 from the entrance to the Hellman-Ehrmann site, is a year round campground, also part of the park. A bicycle trail connects both portions of the park. The campground includes 175 sites with barbecue pits and tables. Showers are also available. From the campground, there are several hiking trails that follow General Creek to a handful of lakes, including Lily Pond (3.5 miles), Duck Lake (7 miles) and Lost Lake (7.5 miles). For more information contact Sugar Pine Point State Park, 530-525-7882. In Nevada, where water is a precious commodity, it’s always a special treat to stumble on a waterfall—even if it’s just over the border in California. Two of the more accessible and scenic waterfalls in this region are Big Falls (also known as Lower Glen Alpine Falls) and Modjeska Falls (also called Upper Glen Alpine Falls). Both of these falls are part of the Glen Alpine Creek system, a snow melt and spring-fed stream that flows into Fallen Leaf Lake and eventually into Lake Tahoe via Taylor Creek. Fallen Leaf Lake is a picturesque, alpine body of water that rivals Lake Tahoe in beauty. In fact, if not for a fluke of nature, namely a small stretch of land that separates Fallen Leaf from Tahoe, the area could easily have been another Emerald Bay. I think it is the "mirror effect" of Fallen Leaf Lake that makes the view so remarkable. Rather than enclosing the lake, the reflection of the surrounding mountains seems to enlarge the scene. About a half mile from the end of the road, which comes to a dead end, you can turn west on another narrow (all the roads around here are extremely narrow, so be careful while driving) paved road, lined by large log railings. This road leads to Lily Lake, a trailhead for hiking into the Desolation Wilderness and to the pair of waterfalls. Frankly, even if Fallen Leaf Lake didn't exist, the waterfalls would be worth a visit. The joyous, rolling waves of falling water are an impressive and unexpected sight. The first waterfall you reach, before arriving at Lily Lake, is aptly named Big Falls, a 75-foot spill that cascades over rock slabs that resemble steps. While the falls aren't nearly as large as 500-foot Horsetail Falls (which are located at the south end of the Desolation Wilderness, visible from Highway 50, near Twin Bridges), they are, nonetheless, impressive and beautiful. You can park off the road here and hike down to the base of the waterfall. From the top, the view of the rapidly cascading water as it falls down the lush canyon is noteworthy. Across the creek, you can also see private homes—people fortunate enough to be able to look out on the waterfall any time they want. The road continues west, paralleling Glen Alpine Creek, for another mile or so to Lily Lake. Opposite the creek, parallel to the road, is a jumbled mountainside of loose boulders and stones, wonderful for casual rock hopping. A concrete bridge marks the end of the driving portion of the road. On the north side of the bridge, you can park and hike a short distance to Lily Lake, a small but photogenic lake literally cupped in the mountains. 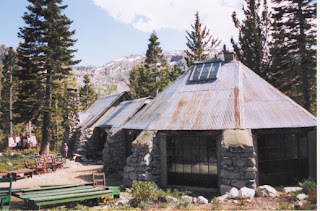 The main Glen Alpine Trail leads northwest from here into the Desolation Wilderness and onto Glen Alpine Springs, an historic mineral spring resort, located about a mile west. An easy half-mile walk from Big Falls is Modjeska Falls, a smaller but equally scenic spill-way. Here, you’ll find picturesque craggy cliffs surrounding a robust 30-foot waterfall. A trail leads to the base of the falls. Modjeska Falls is named after Madame Helena Modjeska, a famous Polish actress of the late 19th century who performed at Glen Alpine Springs in 1885. Those who attended the show were so taken with her performance that they named the nearby falls in her honor. Continuing past Modjeska Falls, it’s only another half-mile or so to Glen Alpine Springs. Nathan Gilmore discovered the namesake mineral springs, originally called “Soda Springs,” here in 1863. 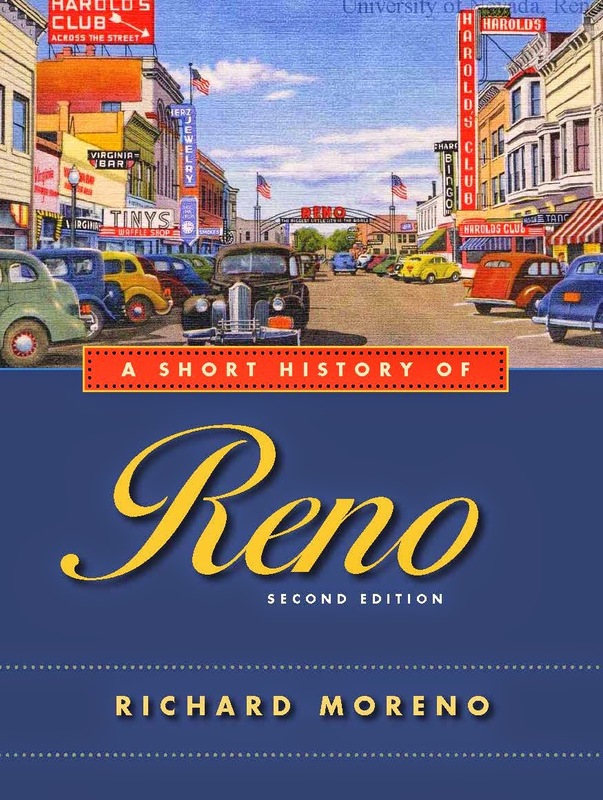 In 1884, Gilmore developed a renowned resort, which included a 16-room hotel, around the restorative powers of the springs, He also began bottling and selling the spring’s water. A fire destroyed most of the original buildings in 1921 but the resort was rebuilt two years later using designs by famed architect Bernard Maybeck (he designed San Francisco’s Palace of Fine Arts). Maybeck and his family summered at Glen Alpine Springs, so he was willing to help rebuild the resort following the fire. Between 1921 and 1929, he prepared plans for some ten buildings; four of which were actually built and remain in use today. The Maybeck buildings include the Assembly Hall, the Kitchen building, a Dining Hall and the Bubblestone Cabin, an experimental concrete building that is considered one-of-a-kind. The buildings are noteworthy because of their extensive use of native materials, particularly local stone. Glen Alpine Springs Resort closed in the 1960s and was acquired by the U.S. Forest Service in the 1970s. Today, a non-profit organization manages the property and helps to preserve the buildings. Glen Alpine Springs is open to the public during the summer months, although it can only be reached by walking. The Assembly Hall now serves as an Interpretive Center and it is open daily 10:30 a.m. to 3:30 p.m. Guided tours are available at 1 p.m. on Saturday and Sunday in the summer (June to late September). For more information about Glen Alpine Springs, contact the Historical Preservation of Glen Alpine Springs, Inc., P.O. Box 694, Glen Ellen, CA 95442, 707-996-6354, www.gasprings.org. Recently, we decided to try something a friend had recommended as something fun to do—indoor rock climbing at Rock Sport Indoor Climbing Center in Sparks. Housed in a nondescript strip mall in West Sparks, we weren’t sure what to expect. But appearances can be deceiving. We entered and were greeted by a helpful and experienced staff that told us everything we needed to know to get started. The staff quickly fitted both of my children, Julia and Hank, with harnesses and shoes because they would be doing the climbing, and gave me a harness because I would be holding the rope. The learning curve for rock climbing is easy. Basically, we were told that someone needed to climb and someone else had to hold the rope, which loops through a large metal pipe at the top. A staff member explained how to tie the proper knots, the best way to hold the ropes, and how to ease the climber down gently after he or she is done (known as “belaying”). Julia wanted to go first, so we slipped the rope through her harness, tied the knot, cinched the rope to the anchoring person, which, in this case, was Hank, and wished her well. She stared at the steep wall, which rises about 35-feet up. Little different-shaped, colored knobs, which serve as handholds and footholds, are bolted to the gray surface. She grabbed the lowest one and began pulling herself up the wall. She actually did pretty well on her first try. She made it about half way up the wall before signaling that she was tired and wanted to come down. To descend, she leaned away from the wall, hanging on to the rope, and Hank gently lowered her to the ground. Next up was Hank. While never having tried rock climbing, he found the going easy. After securing himself to the rope, he quickly grabbed a handhold and began scaling the wall. In short order, he had scampered to the top and was ready to be lowered. After that, the two alternated between which one would climb next. On her third attempt, Julia finally made it to the top of one of the easier climbs (it was in use earlier so she had started out doing some of the more difficult climbs). That particular wall has a bell at the top that beginners can ring when they reached the summit. Hank made several assaults on the most challenging climbing walls—several are built to lean outward, so the climber is actually hanging away from the wall when climbing, while others have large shelves that must be climbed over—before sticking with the mostly diagonal climbs. And when they wanted to rest from climbing the big walls, the two gravitated to several smaller rock faces in the center of the facility that didn’t require ropes but allowed them to practice their climbing skills, including hanging upside down. By the time they were both ready to call it quits, we realized that the time had passed so quickly that we’d managed to spend about half of the day rock climbing. Rock Sport offers about 7,500 square feet of sculpted terrain, including some slabs with challenging overhangs. 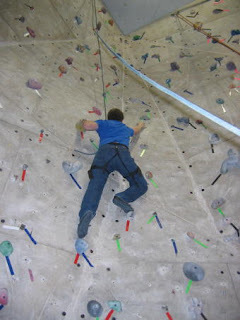 Daily rates are $12 per person plus $5 for equipment (shoes and harness). Monthly memberships are also available. It’s located at 1901 Silverada Boulevard in Sparks. Hours are 10 a.m. to 10 p.m. Monday through Friday, 10 a.m. to 8 p.m. on Saturday, and 10 a.m. to 6 p.m. on Sunday. For more information, call 775-352-7673. They should have named it Big Nose Rock. On the California side of Lake Tahoe, at D.L. Bliss State Park, visitors can find a pair of massive boulders—one perched on top of the other—known as Balancing Rock. However, when viewed from just the right angle, the big one on top resembles a giant nose, complete with an open nostril. Of course, a big nose-shaped rock isn’t all that Bliss State Park has to offer. Located 17 miles south of Tahoe City on State Route 89, Bliss encompasses some 1,200 acres of pristine, forested land overlooking Lake Tahoe. The park is named for Duane LeRoy Bliss, one of the 19th century lumber barons that nearly chopped down every tree at Lake Tahoe. Fortunately, they grew back. At one time, Bliss owned nearly 75 percent of Tahoe’s shoreline as well as the local steamboat line, the train system, and a variety of other businesses. In the 1930s, his family donated about 800 acres of lakefront property to the state of California for a park (the state later acquired additional land). The result is a fine park that boasts several miles of pristine lakeside property including two white-sand beaches. At the north end of the park is Rubicon Point, which is adjacent to one of the deepest parts of Lake Tahoe. One of the park’s landmarks is the Rubicon Point Lighthouse, erected in about 1918. This is not one of those big, round lighthouses like you see in the movies but rather was a small, square wooden structure that sat about 200 feet above the lake and helped serve as a navigational beacon. The lighthouse, which kind of looks like an old pump house, was abandoned in the 1920s. For the next 80 years, it was largely ignored and left to decay. In 1997, however, the state stabilized the building, which ensured it wouldn’t disintegrate into the surrounding forest. A short (3/4 of a mile) but very steep hiking trail leads to the lighthouse. Along the way, hikers can enjoy some of the best views of Lake Tahoe and Sierra Nevada. During a recent visit, we paid the day use fee and drove down to one of the beaches. The water was surprisingly warm so we managed to get in some splashing around time. 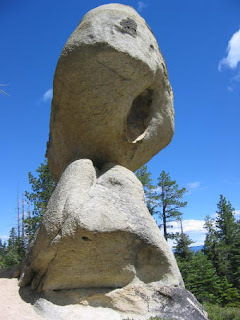 Part of the reason we wanted to visit Bliss was that we had heard about Balancing Rock. We asked the park ranger where it was located and she gave us directions to the Balancing Rock Nature Trail. A brochure at the trailhead noted that the walk was a little under a half-mile. Markers that corresponded to numbers in the brochure indicated the flora, fauna and geology of the area. Reading the brochure, we discovered that we were walking in shallow, granitic soil and that the vegetation along the way includes Huckleberry oak shrubs as well as white, red and yellow fir trees. We meandered on the dirt trail for less than a quarter mile before finally seeing Balancing Rock. It was impressive. A massive football (or nose) shaped rock weighing some 130 tons was perched or balanced above a second boulder. A thin membrane of stone connected the two giant rocks. We hoped it wouldn’t be while we were walking around it. For more information about D.L. Bliss State Park, contact the California State Parks, 530-525-7277 or go to www.parks.ca.gov.